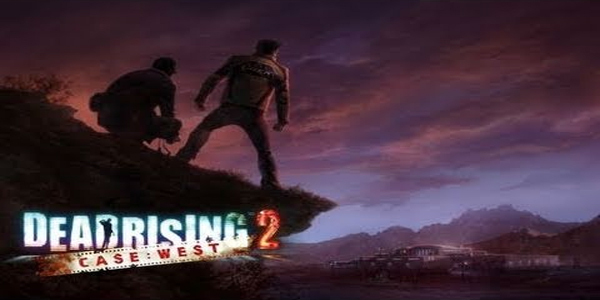 Dead Rising 2: Case West is the second helping of small stand-alone games based off Capcom’s popular Dead Rising franchise. 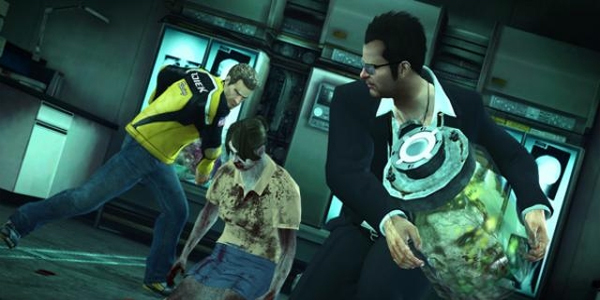 With Dead Rising 2: Case Zero setting record numbers in sales, the idea of a second bite-sized game left gamers begging for more. As a first of it’s kind, Case Zero showed that small downloadable versions of full retail titles can be a serious force in the XBLA world. 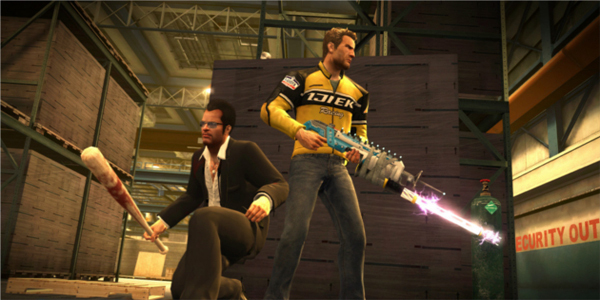 Dead Rising 2: Case West promised a better experience than Case Zero by adding Frank West and co-op play to the formula. Case West may have added a few extra features, but describing it as a better experience is a bit of a stretch. Weapon Combos – Sure it isn’t a new mechanic, but it’s still very satisfying finding new ways to combine weapons. The blue wrench icons stand out like sore thumbs. Good luck trying to remember mission objectives when new weapon combos are more distracting than a house fire. This feature never gets old and it’s always fun and exciting finding new combos. The addition of Frank West – Even though Frank rarely does anything noteworthy in the single player campaign, he’s still good for an occasional bailout. Every so often, he will manage to kill zombies or security forces trying to get in Chuck’s way. He also adds a nice element to the story line. Each character has their own driving force, but being forced to team up with Frank provides a story interesting enough to watch intently when a cutscene triggers. 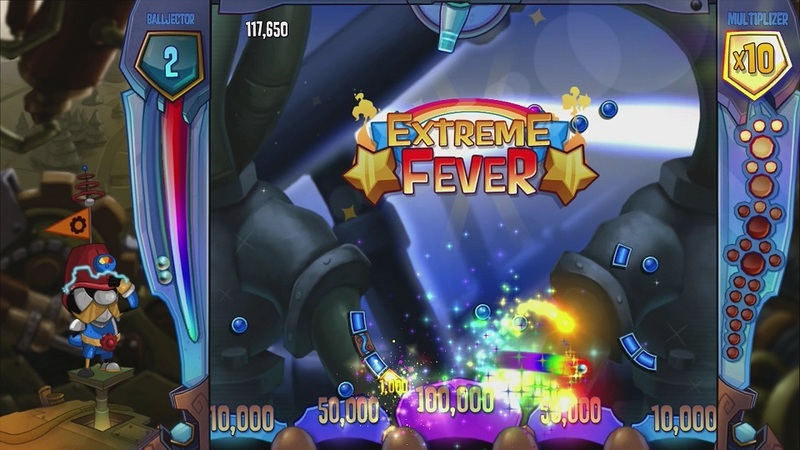 Co-op play – Games are usually better with friends and that statement is true with this title. Case West is an average single player experience, but co-op is where it shines the most. Mainly because adding a friend makes Frank 10 times more effective than AI Frank. Co-op also makes a few of the achievements more fun and easier to unlock. Working with a friend to shoot down all the security cameras serves as a nice mini challenge in between missions. Combat issues – Fighting through security and zombies can occasionally be frustrating. Any altercation that takes place on a staircase is irritating. Swinging a weapon rarely connects with enemies on different elevation levels. There’s also fights with security guards that can seem very cheap at times. When using melee combat with a security guard, sometimes they are able to knock Chuck down first even though their animation sequence clearly started after Chuck’s. This is also true for Hazard Units and Zombie Handler’s. The timeline – The story objectives of this game could have been boiled down to 30 minutes of action. But waiting for a specific time for each mission to start stretches Case West out to a very boring 90 minutes. A way to fast forward the clock would have been much appreciated. Going for some of the achievements can help pass the time, but there’s seriously enough free time in each game to complete each achievement twice. Saving issues – A few save issues were overlooked in Case West. The biggest issue occurs when trying to start a new game. If “new game” is selected, a prompt stating that “all character data and unlockables will be reset” is presented. Meaning that starting a new game requires completing the current game session or purposely dieing first. Another issue that makes Case West more difficult than necessary is the co-op game saving process. When a co-op game is in session there is a host player and there is a client player. When the client player tries to save, they’re immediately dropped from the game. Only the host player is allowed to save but both players are prompted to save when a save spot has been triggered in the story. This leads to a great deal of frustration as most gamers are trained to click on “save” when asked to save. Overall, Case West is a bit of a let down. The price doubled since Case Zero but the game really didn’t progress too much. The co-op feature was a nice addition but the issues with starting a new game or saving a current game make it a forgettable experience. The flow of the game is incredibly boring other than the first play-through. And at 90 minutes in length, most gamers will probably want to play through the game more than once. But it’s still the same old Dead Rising experience for all those who love that experience. It’s nothing special, but it’s not a bad game either.